While historians and mixologists disagree on the exact origin of the margarita, we can all agree that this simple, timeless cocktail is a masterpiece. Have it on the rocks. Frozen. Straight up. With salt on the rim. Maybe sugar. Have it in a cocktail glass or a fishbowl. Enjoy the versatility of the margarita with your favorite Mexican dish (or anywhere). The choice is yours. The Saltine in Portsmouth, Virginia deals in anything shellfish, seafood, and spirits related. This sophisticated restaurant uses the freshest ingredients and “features a raw bar that showcases the region’s finest oysters, clams and shrimp,” according to their website. Margarita lovers will rejoice in their apothecary bar, where they create new takes on classic cocktails. The Tommy’s Margarita, served with Lunazul Reposado, Lime, and Agave, is divine. 2941 Restaurant is known for its sophisticated dishes with clean flavors. Ask for the classic margarita, made with Jose Cuervo Tequila, lime juice, triple sec, and salt. It will keep you coming back all by itself. Ford’s Fish Shack utilizes Virginia’s proximity to the Chesapeake Bay to serve up mouth-watering seafood dishes at each of its three locations. Stop in to their Ashburn, Lansdowne, or South Riding restaurant and start things off right with one of their signature margaritas. You can’t go far in Virginia without seeing a Plaza Azteca Mexican Restaurant. This regional chain has locations up and down the east coast and serves up some of the tastiest margaritas around. 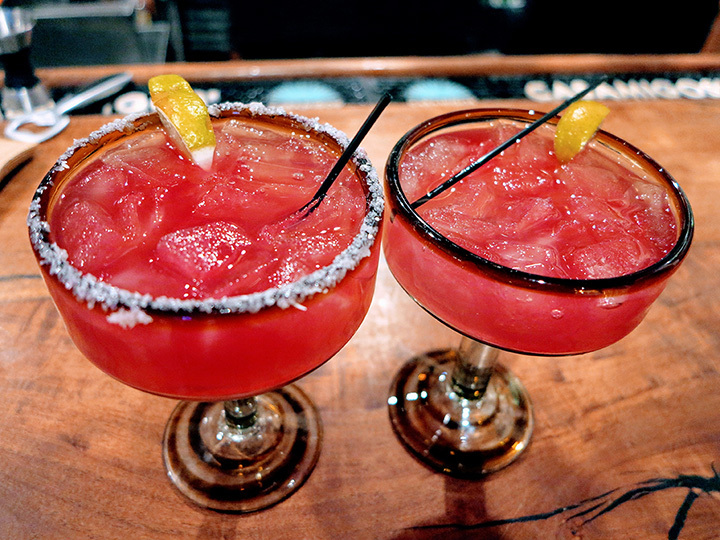 Their signature margarita menu includes over ten options, including their “Beer Rita,” a frozen margarita served with a splash of Grenadine and a bottle of beer. Chuy’s is another regional Tex-Mex style restaurant, this one with five Virginia locations. Order one of their “Famous Rita’s” on the rocks, as a swirl, dot, frozen, or strawberry flavored. Just make sure you’re not driving home; they don’t skimp on anything here. Lalo’s is one of the relatively new kids on the block, but they’ve already distinguished themselves as an extraordinary high-end Mexican restaurant. Their drink menu includes several tasty margaritas, but our favorite has to be the jumbo pomegranate. The swirl is awesome, too. The Bebedero is one of the hip go-to places on the Charlottesville pedestrian mall. Known for their scrumptious Mexican fare, wild decorations, live music and cocktails, Bebedero’s isn’t to be missed. They have two margaritas on the menu, including the House Margarita Pure O Picante, made with Lunazul Reposado Tequila, fresh lime juice and agave syrup, and the classic Cantina Margarita. Taqueria el Poblano has been voted #1 Best Margarita for four years in a row for their delicious drinks served at their three Arlington and Alexandria locations. The Taqueria Margarita took home the prize every year since 2014 as voted on by the readers of Washington City Paper’s Best of D.C. The margarita is made with fresh lime juice, Triple sec and Silver tequila. 3 Amigos brings authentic Mexican cuisine to Virginia Beach at a reasonable price. The restaurant is family-friendly and offers delicious margaritas in multiple flavors. We recommend the mango frozen margarita. Margarita Grill is a “chef driver restaurant” in Burke, Virginia serving up Mexican lunch and dinner dishes. We recommend coming in for their Happy Hour from 3 p.m. until 7 p.m., where you can try their Jose Cuervo Classic Margarita or Frozen Margaritas in lime, strawberry, or swirl for only $6 each.